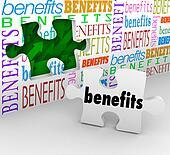 The City offers health insurance coverage to all eligible employees and retirees. Eligible employees include all regular full-time employees, all regular part-time employees who work an average of 20 or more hours per week, and all school crossing guards employed prior to July 1, 1993, regardless of hours worked. Employees share in the cost of such plans. Eligible City of Jackson retirees include retirees who are under the age of 65 and their depentdents. (Retirees under age 65 entitled to Medicare due to disability and their dependents are not eligble for coverage.) It also includes all City of Jackson Police Officers and Firefighters and their Dependents retired under the 20 year plan who are not eligible for or entitled to Medicare Benefits. (NOTE) - Effective March 1, 2007, the City of Jackson eliminated all Medicare Supplements. A group dental insurance plan is available for all eligible employees and retirees. The Dental Plan is fully-funded through Delta Dental paid at a 100% by the employee. The City reserves the right to change carriers, modify covered benefits, or make any other changes to the dental plan as necessary to serve the best interest of the employee & City. All full-time and regular part-time employees accrue vacation according to the length of service. The Police and Fire Departments have specific procedures regarding accrual and use of vacation leave; employees of these departments should consult their department handbooks.